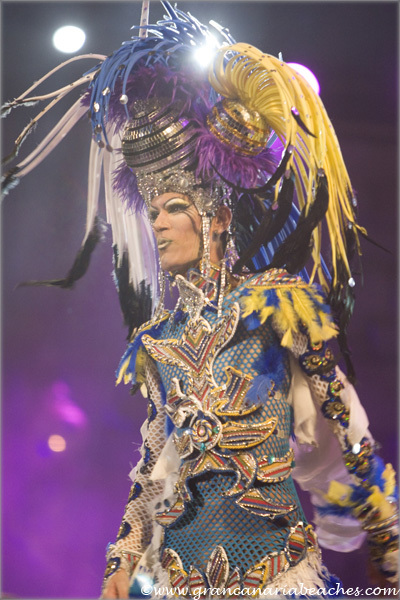 The Gran Canaria Drag Queen contests are the most unique and entertaining shows of the carnival. They are world famous and keep drawing attention year after year. The contests takes place in Las Palmas (the capital) and in Playa del Ingles, Maspalomas (south of the island) every February. The Las Palmas carnival contest is always held in Parque Santa Catalina, while the Maspalomas one is held at the Yumbo Centrum shopping centre. Gran Canarians eagerly await this event. Many of those who attended the show, had to stand in the queue for lots of hours, to buy the tickets. Some even set up tents there, the night before. When the ticket booth opened, they were over in less than two hours! During the show, the crowd gets highly excited, jumping up and down throughout the show, which lasted over 3 hours. The show organizers always bring international singers to perform at the contest. This year Marta Sanchez (Spanish pop diva) and Rozalla (famous for her hit “Everybody’s Free”) came to sing. 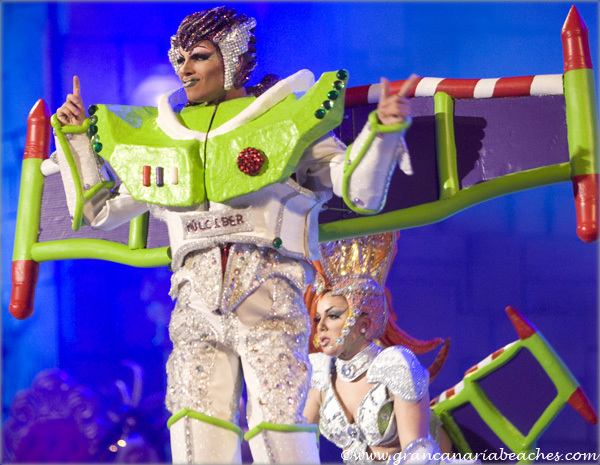 For this year (February 15th, 2013), the Las Palmas de Gran Canaria Drag Queen Contest had 27 participants. Out of these, 16 qualified for the final. Many used parts of the famous hit “Gangnam Style” by Psy, for their choreographies. Each drag queen prepares for this event months ahead, and tries to get hold of a sponsor to pay for the costly outfits. It is not restricted to males; the last contestant, “Drag Noa” is a woman and participates, year after year. Four juries chose this years winner: media, invited guests, fashion and make-up experts, and TV viewers (who voted by phone). Here’s the video of the event. We recommend you to get a beer, a comfortable chair, and watch it full screen. 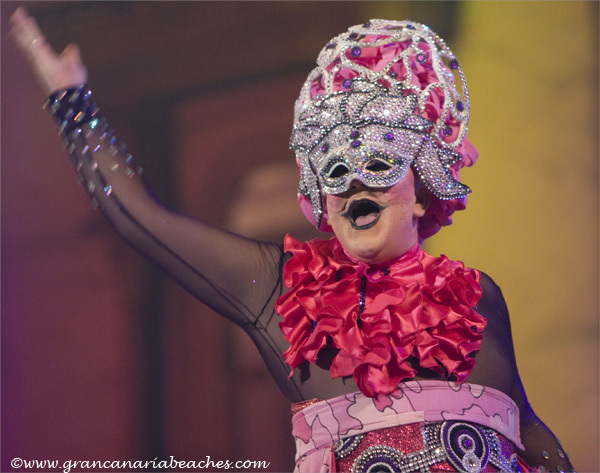 ...and the winner of the Las Palmas de Gran Canaria Drag Queen Contest is.... Drag Xoul, with the outfit called “Okobango, The Jewel of Kalahari,” sponsored by the Arrecife de Lanzarote Town Hall. Congratulations to him and to all the other contestants!! !